Remember all those white faux-hippies from college who smoked tons of pot and really got into the nuances of it? Glass-blown vs. wood vs. metal bowls. Stinky orange buds vs. bright green with bluish crystals. Saying reefer vs. ganga vs. weed. Some of them grew older and landed good jobs that won’t be forgiving if they get arrested. They’re the craft brew nerds shifting America’s beer scene. Tasting 3 Floyd’s Dark Lord 2017! No idea who that guy behind me is. I spent the past weekend attending 3 Floyd’s Brewing Company’s Dark Lord Day, an annual release of their Dark Lord Russian Imperial Stout. 10,000 tickets are sold to the event that’s part bottle share, part heavy metal concert, half waiting in lines for food/beer/port-a-johns, and all fun. It was my second time attending, hubby’s sixth, and we love it. At some point early in the day, while I’m letting the sheer force of crowd volume wash over me, I settle with the idea that I’ll be in very close quarters all day. I’m not used to it, and it can feel claustrophobic, so I need to down a good 15% ABV milk stout to make peace with it. And there was a unique flavor this year; I understood that acceptance including being okay with the all-white crowd. I’m all good with white people, but a decade working in higher education–a world hyper-sensitive to cultivating visibly diverse environments–triggers a natural anxiety born of guilt when I’m in an all-white crowd. You have to also understand that I worked in recruitment communications, meaning I was not only part of the crew tasked with bringing diverse bodies to campus, but I had a hand in crafting the marketing material that showed how the college looked to those prospective audiences. Are there enough brown kids in this brochure’s pictures? Are they brown enough that the casual viewer will notice? Are there too many brown kids in this brochure? We don’t want to mislead people, but we do have enrollment goals to meet. I kept feeling this guilt long after I left the world of higher education, feeling annoyed when it cropped up to remind me of the neuroses I inherited from the job. I asked myself a lot of questions, processing why I felt it was “bad” for an environment to be all white. If an environment was all black, I would respect that. My academic studies taught me that people in the minority need to spend time with people like themselves, that’s why any kind of successful integration is done in cohorts. So if I’m in an environment that’s all white, is that not my own kind of cohort? Is it okay for white people to have cohorts? Our educational culture’s obsession with “diversity” initiatives is a noble pursuit, well intentioned but disingenuous. After all, “diversity” is usually a code word for “race,” and the results are measured by a simple accounting of colors in the crowd. Adding some people of minority races doesn’t make a place diverse any more than a rabbi attending church makes Sunday mass an interfaith service. The trick to overcoming my anxiety is asking myself why the crowd is all white. Is it because people of color would not feel welcomed here? Or is it because this day, this event, this pursuit are just not something of interest to others? To find yourself at Dark Lord Day means you are 1) into microbrews 2) have hundreds of dollars to spend 3) have a desire to spend hundreds of dollars on said microbrews 4) have leisure time 5) want to spend that leisure time on pursuing obscure beer 6) enjoy being drunk, outside, around thousands of awkward strangers. The criteria whittles down to a very specific group of people. Most people of any color wouldn’t like this. It took 43 minutes after the race started to reach the starting line. Good times. The weekend before Dark Lord Day, I ran my 3rd half-marathon. The running world, specifically big city races, is also a white space. The world-class level of competition in long-distance running its dominated by dark-skinned Africans. At the leisure level in America, the sport is mostly white. And as I run through our beautiful cities, I enjoy the spectators who cheer us on, the homemade signs along the way that say things like you’ve been training longer than Kim Kardashian’s been married or run like the cops found your stash or even you run better than the government. But then you run past signs that say hurry up, the Kenyans are winning and it’s not hard to understand why people of color are few and far between. The whiteness of the running world has bothered me because I think us white people don’t make it a place people of color would want to be. That’s a shame, because running is awesome. You learn a lot about yourself several miles into a long run. Why would we want to keep people from accessing that? There are some pretty cool initiatives dedicated to diversifying the running world. Black Girls Run is one. The after-school program, Girls on the Run, is another that values diversity and has councils serving young girls across the country in many different neighborhoods. 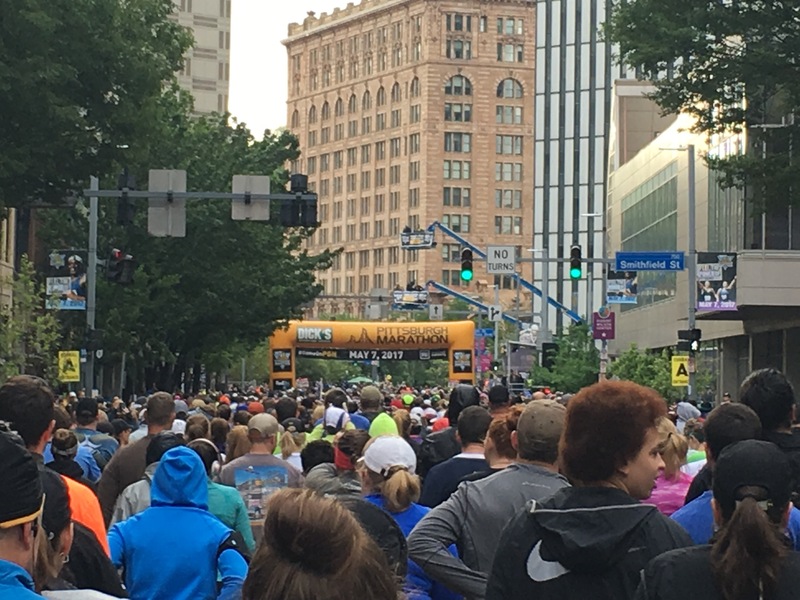 At this year’s Pittsburgh Half, I noticed an uptick in the diversity of participants. In my starting corral I looked around and thought “Wow, there are a lot of black people here, and that’s awesome!” It surprised me and made me happy, not because the crowd met some imagined quota, but because I don’t want people to feel shut out from things I love. I was on my own, and I struck up a conversation with a woman of color standing next to me. It was her first half. She was nervous, and running partly because of a health challenge at work but also as a tribute to her mother who passed away the year before. I shared my own reasons for running, also related to my mother, and we wished each other luck. I also explained some of the starts and stops we were experiencing because the race starts in waves, and I know that’s confusing to first-timers. You hear a start gun, move a block, and then have to stop and wait for another 10 minutes. Your adrenaline gets the best of your. I know that I would have chatted with whoever ended up near me, but I felt a responsibility in this case. I can’t control a whole crowd and ensure everyone feels welcome or has a good time. But I can have an impact in my own little sphere, and that’s what I tried to do. For everyone’s sake.